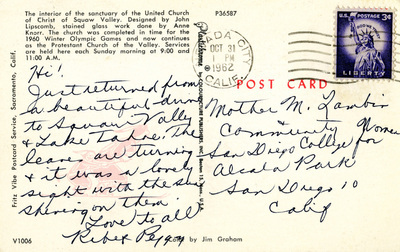 "California – United Church of Christ of Squaw Valley"
The interior of the santuary of the United Church of Christ of Squaw Valley. Designed by John Lipscomb, stained glass work done by Anne Knorr. The church was completed in time for the 1960 Winter Olympic Games and now continues as the Protestant Church of the Valley. Services are held here each Sunday morning of 9:00 and 11:00 A.M.